I spent the weekend at Kabini River Lodge about 2 1/2 hours from Mysore, in the southwestern corner of the neighboring state to Tamil Nadu, Karnataka. Kabini is a former hunting lodge of British diplomats and royals as well as the would-be royal, the Maharaja of Mysore--the appointed Indian ruler of the Mysore area. Built in the 1800s, it is a fantastic place---deep in the wilderness, at the edge of the Nagarhole National Forest, lush and secluded. Although not a Marty-friendly place (no air conditioning, very little meat, and bone-jarring rides through the backwoods), Kabini offered peace and quiet and wonderful views of wildlife---not to mention a joyride on an elephant (my first). The place was full of pictures of from the days of the British raj--a delegation from Russia camped there in the 1890s, and the last British viceroy to stay at Kabini was Lord Mountbatten, shown in a 1933 photo with then Prince Edward (three years before he abdicated the throne to "marry the woman I love."). It was also surprisingly cool after the sweltering heat of Chennai. Mysore was not returned to India until several years after independence, and Kabini was used for a number of years by the Indian military. It became a resort in 1979, after the construction of a dam that flooded local villages, but also provided a more secure environment at Nagarhole for wildlife. It was at that time that Colonel John Wakefield---now nearly 90 and a resident of India for most of his adult life, save for schooling in Britain and service in the British army in Singapore and Burma during World War II ---came to Kabini. He still lives there in a wing of the Viceroy's compound, and entertains visitors with lively tales of the area's history. Now a committed conservationist, he shot his first tiger at the age of 9. The Nagarhole park which Kabini abuts has about 65 tigers, but as the park is over 300 sq. kilometers in area, that makes them difficult to sight, and I wasn't lucky enough to see one on this trip (though one was spotted the week before). The closest we got was to see the telltale "pads" along the dirt road, where tigers often traverse at night. One group did see a leopard (for 45 seconds) which is even more unusual to spot than a tiger, and we saw a pack of wild dogs, which are also considered rare. 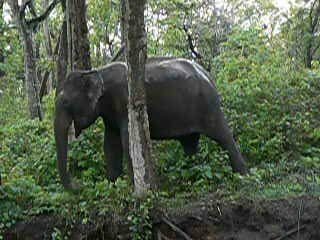 More common are elephants---including stately "tuskers" (in Asian elephants, only the male has tusks)--spotted deer, barking deer, gaur (Indian bison), peacocks, wild boars, and painted storks. We went out in safari jeeps late in the afternoon and early in the morning, which are the best times. One afternoon, we also went by boat and saw a couple of crocodiles, but I much preferred the jeep rides. It was wonderful to see so many elephants in the wild--munching on bamboo along the road, a mother leading her two calves through the forest, a lone tusker by the water in the late afternoon. A pack of ten wild dogs entertained us this morning, watching us warily as they made their way down the road and into the woods. These are not guys you'd want to mess with--though tiny, two of them can fell a spotted deer and the pack will clean it up in 15 minutes or less. By the water in one spot was a tiny Ganesha--a Hindu god that is part elephant--and he certainly seemed to symbolize the place. This was the last good weekend to visit Kabini, though, before the monsoon, which hit the coast this morning. Over the next two or three months, Kabini, along with much of the rest of Karnataka, will be drenched with rain, and while the forest will be lush and green, it will also make the dirt roads impassable and hide many of the residents ---including the elusive tiger. I am planning to leave for kabini this weekend,any idea when exactly rain starts ? and how about the road from Mysore to Kabini? If the monsoon has started, it may be wet! In which case, I don't know how the roads within Kabini are affected. It is about a two hour ride from Mysore to Kabini. Roads were good. Good luck.